Cybersecurity remains top of mind within the business world and specifically in the legal field. Keeping data and web-based records secure and confidential is critical to success. Every legal leader needs to be aware of best practices when it comes to prevention and response. In the case of cyber threats, your organization’s reputation, client confidence level, and your bottom line are all at stake. According to a study from the Ponemon Institute, cyber crimes cost an organization, on average, $15 million annually. Protect your legal firm, clients, and employees, by downloading the complimentary Industry Insight Report from Modern Counsel below! Hear from a few legal experts as their share their advice on ways to combat digital hacks when crafting your firm’s prevention plan. However, he says many of these human errors are preventable within a leadership philosophy that is hands-on. This means knowing who has access, what data and information is being stored, and any risks areas that hackers could target. Crista Harwood, senior vice president, general counsel, and chief administrative officer at Passport Health Communications, advises legal professionals to take an active approach to gaining a higher level of technical insight. Read more about how every legal executive can learn from their tech team and the two key elements of preventing cyber risks from our experts in this free report. 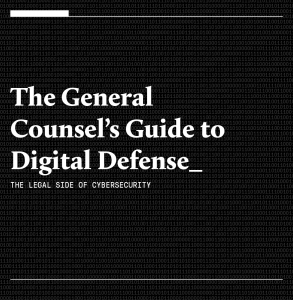 Download The General Counsel Guide to Digital Defense. The Legal Side of Cybersecurity by clicking below.